The normal hustle and bustle around the Public Health Department in downtown Kingstown came to a grinding halt when gunshots rang out around 10 a.m. Details surrounding the shooting are still somewhat sketchy. When the smoke cleared, two vehicles were left with bullet holes and 23-year-old Jeremy Riley of Edinboro was in police custody nursing a gunshot wound to his finger. Searchlight understands that there was a shootout between unidentified individuals, and one of the men involved sought refuge behind a private vehicle parked in the area. As a result, bullet holes were left the hood of the vehicle. A government vehicle was also hit in the hail of fire. The dental technician told SEARCHLIGHT he was at work when he heard several gunshots. King said he looked out the window and saw a man dressed in a yellow rain coat and a yellow bandana around his face running between Finishing and Furnishing building with a firearm in his hand, heading upstream the nearby river. Seeing this, King grabbed his licensed firearm and walked along the Roman Catholic School area in hope of catching the man. King said he asked a security guard at Gibsonâs lumberyard if he saw two men walk that way. âAt the same time I looked in the Victoria Park and saw two guys, one in a black pants, so I knew it was them instantly,â recalled King. The 53-year-old said that he got a ride in a vehicle and called the police to inform them about what was taking place. 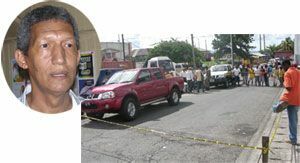 After being dropped off in the area of the Milton Cato Memorial Hospital near to Victoria Park, King spotted one of the men and approached him. âI went and hold onto him, but he told me it was the other guy who had the gun and as he said that, he pulled a gun from his waist and pulled the trigger but it was jammed. I fired twice with my gun and a shot caught him.â King said. The father of 14 said that he would assist the police in anyway he can. âIf people were afraid to do like what I did, what kind of society would we have? I not afraid of anyone,â King stated. The police arrived on the scene and a 9 mm pistol was recovered. The other defendant King identified as being dressed in all black was up to press time still on the run. At press time, no charges had been laid against Riley.